Ginseng is a root herb championed in traditional medicine for its health benefits. The two main kinds of ginseng vary as a result of the climates they grow in. Although both types contain active compounds called ginsenosides, Oriental ginseng has been found to lower blood pressure, while American ginseng does not. Also, Oriental ginseng has a stimulating effect, whereas American ginseng has a more relaxing, stress-relieving effect. Oriental ginseng, scientifically known as Panax ginseng, is native to China and Korea and is sometimes called Asian ginseng or Korean ginseng. Fresh Oriental ginseng is often referred to as white ginseng, after its natural color. When dried, it turns tan. In a 2012 study published in the "Journal of Agricultural and Food Chemistry" on hypertensive rats, the introduction of ginseng to the rats thickened the walls of their blood vessels and lowered their blood pressure. This suggests Oriental ginseng may prevent high blood pressure and even lower blood pressure in humans. Red ginseng is Oriental ginseng processed with heat that turns it red and prolongs its shelf life. Scientists confirmed in a study published in "General Pharmacology" in 2000 that red ginseng also reduces blood pressure in hypertensive rats. In a study published in the "American Journal of Chinese Medicine" in 2000, researchers treated one group of hypertensive patients with red ginseng and the other hypertensive group without ginseng. They found that the red ginseng group experienced increased blood flow compared to the nonginseng group. Because increased blood flow is associated with lower blood pressure, this suggests red ginseng helps alleviate hypertension in people. American ginseng, or Panax quinquefolium, is native to the Appalachian mountains of the United States. In a 2005 study published in "Hypertension," scientists looked at the immediate effects of American ginseng by measuring participants' blood pressure every 10 minutes for 160 minutes. Compared with participants given a placebo, those given ginseng experienced no difference in mean blood pressure levels. 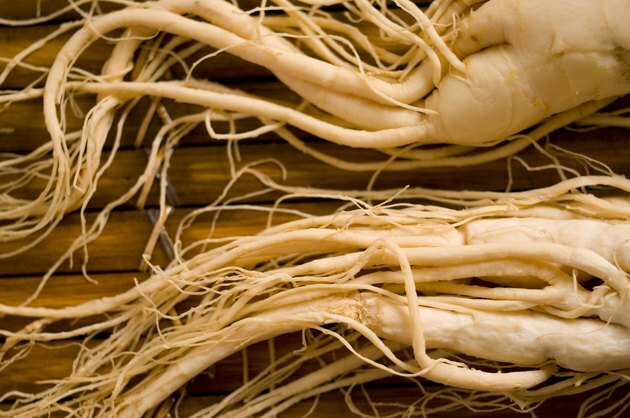 Scientists found no association between American ginseng and blood pressure. In a 2006 study published the same journal, researchers found that American ginseng had no long-term effect on blood pressure either. After participants' blood pressure levels were checked regularly during three months of taking either ginseng or a placebo, researchers found no difference in blood pressure between the ginseng and placebo groups. To consume fresh ginseng, cut a few thin slices of the root and add it to boiling water to make ginseng tea. You can also mix it into food by simmering a few slices in your soup or other dishes. Ginseng is available in powder and capsule form as well. You can add the powder to smoothies or sprinkle it over your food. When you buy packaged ginseng, make sure it includes "Panax" as part of its name. According to the American Cancer Society, ginseng products from Siberia, Alaska, Brazil and other areas can be mislabeled. Commission E, Germany's regulatory agency for herbs, recommends 1 to 2 grams of ginseng per day for up to three months. How Much Ginseng Should I Drink a Week?